​When we started DUFFA Alan Heckman, our Chair, suggested over a RPA (reasonably priced ale) that he'd like to run a Hat Tournament. After initial grumblings of "effort" and "we quite like things the way they are" the idea got some support and, as is usual in clubs like ours, there was a small power struggle when a fringe member tried to take it over *. The Hat was saved due to some political wrangling but not before the words "you won't be able to run a tournament without me" were uttered. That, if it were required, provided the inspiration to make DUFFA Hat (in our opinion) the best damn tournament in the world! We continue to strive to make it unique and special - it's only thanks to the numerous people behind the scenes that give up so much time to make it happen. The world needs more Hat tournaments! * The old adage "too many cooks spoil the broth" is apt here. Price: £16 or £14 if you signed up with four or more people! Our first Hat – many people couldn’t believe that one of the two organisers hadn’t been a tournament before and the other not to one in the UK. We had cotton T-shirts and the concept of pitch music was a shock. We went to town on the theme! Good vs. Evil ran through everything – your team was either good or evil. We had pitch side music and the party was bigger and better! Steve Morgan finally got his way and we had a bouncy castle! 2010 – When I Grow Up! Following feedback we moved from cotton T-shirts to athletic tops. The party was a bit of a squeeze. This year featured some of our favourite fancy dress efforts of what people wanted to be when they grew up! We added a marquee to provide party space and had a live band! The shirts were better quality and all uniform. The party featured jugglers and circus games. We woke people up on the Sunday morning with a bugle rendition of “Reveille” followed by the very wonderful Stockport Silver Brass Band. 2012 – A Blast From the Past! We added a marquee to provide party space and had a live band! A hog roast was provided and each team had a battle standard that they got to decorate. The bouncy castle was replaced with a titantic inflatable slide! Attendees: 288 - 3 minute sell out! After selling out an incredible 3 minutes after opening registration (our server threw error messages our sys admin hasn’t even seen before due to load) we threw everything we had into 2013.. and it didn't disappoint! Our ocean themed spectacular, with new TD Richard Harrison at the helm, featured some of the best fancy dress costumes DUFFA Hat has ever seen and the coveted player spots gave it a special feel for those that got to come. 2014 – Out of this World! Attendees: 288 - Lucky Lottery Winners! After the previous 3 minute sell out we created a weighted lottery. Over 500 people applied for a space to go into Outer Space! The fancy dress winner was none other than WALL:E and the spirit felt higher as players felt lucky to make it through our weighted lottery. 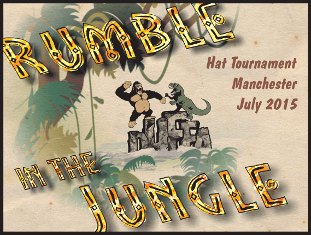 2015 – Rumble in the Jungle! Yet more new blood to our organising Committee brought exciting new ideas and enthusiasm! With Simon Ingram joining as Co-TD, registration and accounting duties ably handled by Sam Jones and even with a guest trainee DJ "power hour" slot we had a RUMBLE IN THE JUNGLE! Highlights included: our 23rd vs 24th game was interrupted with silver service beer and a Benny Hill moment with a Gorilla chasing a Banana (you had to be there). 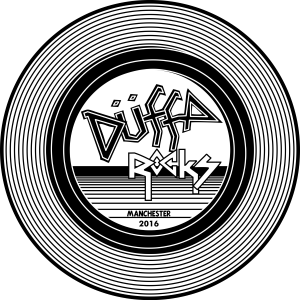 2016 – DUFFA Hat ROCKS! It was showdown at high noon for our TENTH anniversary hat. TD Simon Ingram and the Hat Committee and volunteers brought a taste of the Wild West to East Didsbury. DUFFA Hat 2017 highlights included: a live band - Xander and the Peace Pirates, party costumes like a 2-person horse, a lady tied to a train track and a few cowboys. Campers were woken up by our very own in-house Mariachi (who's extensive set list stretches to 2.5 songs, and they even knew some of the words). 2018 - The Fallow Year After 10 great years... we needed a rest. 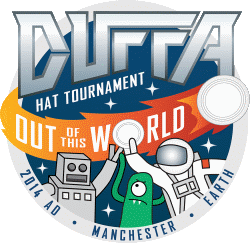 After 10 successful years, DUFFA have made the hard decision to take a break and announce that we won’t be running DUFFA Hat in 2018. We're sorry to be having a "fallow year", but we know how some of you plan your holidays, and even your weddings, around our tournament (which we're very humbled by), so we wanted to let you know about this as soon as possible. We also hope this gives any budding TDs a space to run their own Hat next year. Thank you to the hundreds of players and volunteers who made our Tenth(!) Hat in 2017 so special. If you need a DUFFA spirit fix don't forget we continue to play pickup twice a week in Manchester and our sessions are open to all – see details of our sessions at www.duffa.org ! Keep the discs flying, the spirit super high and, most of all, keep encouraging the beginners onto the pitch... we know that you will!